Recently refurbished, the hotel is on the airport complex. All rooms are air conditioned, there are four dining options, inc. an oriental restaurant & within the hotel there is a gym. All inclusive holiday parking at Peter Ashley secured car park 1 mile from hotel. Your car will be moved by an insured driver to the car park and taken back to the hotel for your return. All rooms have en-suite bathrooms, tea/coffee facilities, TV/pay movies/play station, internet access at a charge, trouser press & hairdryer. Children in family rooms should be 15 years or under. if booking a Superior Double you will also have, high quality bed linen, relaxing aromatherapy 'this works' sleep spray, luxurious toileteries and complimentary mineral water. The hotel has one suitable room, please request at time of booking. All inclusive holiday parking at Peter Ashley secured car park 1 mile from hotel. Your car will be moved by an insured driver to the car park and taken back to the hotel for your return. Clients parking overnight only will be subject to a charge of £15. You will need to leave car keys with hotel. 2 restaurants inc. Sampans Oriental. Lounge bar and Callaghan's 'Irish' pub also serving food & 24 hr room service. Club lounge offers complimentary snacks & drinks. *** In Dinner, Bed & Breakfast Offer, the breakfast is full english or continental & dinner is a 3 course dinner to be taken from the set menu in the main restaurant. Breakfast buffet starts from 05.30 and is £17.00 per person. Club Rooms get complimentary continental breakfast Mon-Fri from 06:30 in club lounge and complimentary breakfast in main restaurant at weekends. We stayed in a club room, which gave us access to the private room where you can get complimentary snacks and non alcoholic drinks during the day with alcoholic drinks served between 6pm to 8pm, the snacks served during this time were very limited and had gone down in quality and quantity from previous times, however the young man serving was very pleasant even though he was very busy due to the room being full. All the other staff we came into contact with were also very pleasent, the hotel was clean and the bedroom was comfortable. We often book Crown Plaza for an overnight stay before our holiday. Checking in easy. Our room this time seemed smaller than before, downstairs on left but was adequate. Everything you needed was there. Noticed pillows seemed very flat! We ate in the Asian restaurant which was great. Transfer was really good to and from. Checkout was a bit prolonged due to numbers of people checking in. Eventually staff realised there were a lot of people just waiting for their keys. Otherwise a great experience annwould book again. When we arrived back at the hotel our car was not at the hotel , we went to reception to be told our car wasnât in the car park , they would get us a taxi to go and collect it , I was not happy the car parking was 20 mins away , so this added on over 30 mins on our journey back home. This is not what you pay for . Fantastic, fast service. Nice room, quick airport drop and easy quick collection. Excellent service, used shuttle bus to check in luggage night before flight. Nice quiet room. Good parking service-car collected from and returned to hotel car park with only 4miles on clock. Absolutely no problems at all... Been a few times now with The Crowne Plaza and would definitely use them again. Got a lift to the terminal the day before travel so we could drop bags off as well. Easy pick up on our return. NOT the hotels fault, but the drop off / pick up is slightly away from Terminal 2 now - better organised, but further away. Just to be aware. Hotel accommodation was ok, Dinner service was poor - very slow & some, not all, staff interest was non-existent. Check in efficient. Thai(?) restaurant very good. (Pleased to have gone early as serviced slowed considerably when became busy) Comfortable rooms. No problem with early morning transfer or pick up on busy Sat afternoon. Would use again. Only downside was it was difficult to get to! As warned on booking, the SatNav was no help. After twice being led back to motorway in Friday rushhour - finally got an airport taxi driver to âleadâ us !! Unfortunately the hotel had given our room to someone else with the same surname and it took over half hour of waiting at reception to sort out. This was after a 2 hour drive there. The room they gave us wasn't ready for three people so we had to wait for an extra bed and didn't have enough towels either. Reception staff did not deal with the problem very well and communication was very poor. Hotel was conveniently located with shuttle bus very early as required. However, nearby building site noise was not good starting at 7 am. Hotel car park very expensive on top of high room price. Nice hotel-comfortable bed /quiet room. As part of our booking we had parking (included) at the hotel whilst we were away. Recovery of the car when we came back was rather protracted as reception couldn't find out where it was. Eventually someone had to walk around all the car parks to find it. One young female receptionist was particularly unsympathetic. That cost u a star in the rating! Good service all went smoothly. 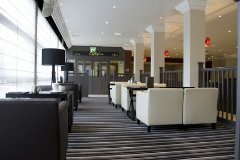 Crowne Plaza Manchester Airport. Great place very nice staff in the lounge bar. The staff were friendly and helpful. The meal in the restaurant was delicious. The service was excellent. We would definitely stay again. Nice hotel, very convenient and a good shuttle service. Ticked all the boxes. Great service made the holiday easy and relaxed. Excellent location, service and facilities. The staff are very friendly and attentive. Only thing is I would have liked a room closer to the lift as requested, as it was quite a walk to the room for my disabled daughter. Staff helpful rooms clean and comfy. Ideal to leave your car when going away, it takes away the early morning drive to the airport. Only thing I would comment on is the shower is in the bath and it's quite a big step up to get into the bath, my aged mum had to do without a shower when we stopped as there's no way she could get in, I don't know if there are rooms with just showers. The hotel offers a 24hr complementary airport shuttle service. Exit the M56 at junction 5 and follow the signs for Terminals 1 and 3. Go through 2 sets of traffic lights take the 1st exit at the roundabout the Crown Plaza Manchester Airport is located on your right. The hotel is partnering with local operator, Peter Ashley Car Parks who are located 1 mile from the hotel. For any Park, Stay & Go arrivals you drop off your vehicle with the hotel. Your car will be moved by an insured driver to the car park and taken back to the hotel for your return. You will need to leave car keys. ADDITIONAL DAYS PARKING PAYABLE @ £15.00 PER NIGHT. (£15.00 will also be charged for overnight parking on 'room only' stays). Please note: you will only be able to park one car (no minibuses or coaches) per room booked. In Dinner, Bed & Breakfast Offer, the breakfast is full english or continental & dinner is a 3 course dinner to be taken from the set menu in the main restaurant. Club rooms are available for £40 (Mon-Thurs), £50 (Fri-Sun) supplement, this will include Kingsize bed (max 2 adults in these rooms, no rollaway beds), Luxury linens, towels & bathrobes, luxurious toiletries, 32" Plasma TV, Mini bar - charged as taken. Access to club lounge access which offers Complimentary continental breakfast 6.30am-9.30am (the club lounge is closed in the mornings on Saturdays & Sundays so guests can take breakfast in the main restaurant without additional charges),Complimentary snacks throughout the day inc. soft drinks & tea/coffee, Complimentary canapes & alcoholic beverages 6.00pm-8.00pm, Access to a PC, Newspapers/magazines & plasma screen TV. Over the xmas period the main restaurant is open but restrictions do apply to the other restaurants. Please call for full details. Can I get to terminal 3 via walkway from crownplaza plazayou will have to go outside to walk to termnal 3 from the hotel, they do provide a free shuttle bus that ca take you to terminal 3. Dear Sir,i would like to book hotel and parking , please let me know, if you have family roomsand triple rooms. thank you,ElizabethThank you for your email. We do offer Family rooms 3 (2adults/1 child) and triple rooms (3 adults). Rooms are subject to availability.